Those are my resolution, but they will remain dreams unless I define them more precisely and turn them into goals... so here we go! Get educated about finance managing, define a budget, stick to it and adapt it to big changes in my life. Now to get to that point, I need a plan. Setting goals without knowing how to achieve them is like going on a trip into an unknown country without a map: you have great chances to get lost along the way, even if you know where you're going! Since this is a long journey (a year-long one, to be precise), I will break down my plan into manageable, monthly steps. Credits: papers by Victoria Greenlees (Crafty Fall@ chirpi.co.uk), stitching by Chere Kaye (Tristan's Treasures collab @ TDC), "2009" and month alpha by Victoria Greenlees (Delicate Dreams @ chirpi.co.uk), "my goals" stamps by Michelle Coleman (Stamped Alpha freebie), swirls by Christine Smith (Flourish), fonts by Darcy Baldwin (DJB Lorraine Bold and DJB Chloé). Those sound like great goals! Best wishes in meeting them! Its so inspiring to read your post, congrats on being so motivated!! 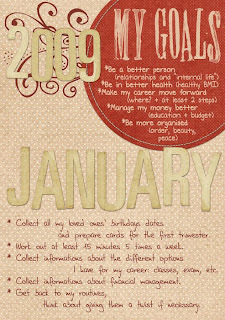 You have some awesome goals for this year and I know you will do awesome! What a lot of thought you put into all of this! Good luck to you on doing it all! I resolve to try and be more healthy and more organized, especially since we are going to be selling our house in the spring. Awesome job Chloe! You've put a lot of time and effort into this already! Good for you! :) I know you can do it! great goals! i like how you broke them down by month - happy new year!